Saying “the pint glass is more than half full,” Mayor Greg Fischer this morning announced a report containing recommendations for furthering the rapid growth of Louisville’s craft beer industry. The five recommendations range from developing an official beer trail and map of local breweries to changing beverage control laws to be more beer friendly to creating an internationally recognized event to spotlight beer that is aged in bourbon barrels. “Like bourbon, the craft beer industry is red hot, nationally and locally, with new breweries and restaurant operations opening throughout our city and just across the river,” Fischer said during a press conference at Against the Grain Brewery and Smokehouse. “Our goal is to accelerate this growth and maximize the benefit to our economy, culture and tourism. Fischer also noted that, nationally, sales of craft beer rose by 18 percent in 2013, while overall beer sales actually declined. The growth has happened locally as well; currently, the Louisville Metro area is home to a number of breweries, with several new ones in the process of opening. Develop an official beer trail/beer map/website/video combination to help promote all local breweries and offer both residents and visitors information on what sets the breweries apart, where they are located, and offer virtual and printed maps that can be seen/distributed at the breweries and other places around town. A bike trail would also be developed with local artists and breweries creating bike racks in front of each brewery. Change Alcohol Beverage Control laws to be more beer friendly. Currently, it is a difficult and winding process to open a brewery, and with the brewing community growing in Louisville and around the state, breweries feel the process should be more intuitive and organized. In addition, it remains difficult for breweries to hold special events, conduct tastings and other promotional activities. Represent local breweries and their products in more city events, functions and venues. Since alcoholic beverages must run through distributors as part of the post-Prohibition three-tier system, it can be difficult for smaller, local breweries to be represented at large events. The goal is to bring down the walls that have blocked local breweries so they can be represented, specifically in city-affiliated events and venues. Create a bourbon-barrel event that will be recognized nationally and internationally. Bourbon is a natural draw, which makes bourbon barrel-aged beer a logical and national way to represent Louisville’s brewing community. Growing such an event not only promotes beer hand-in-hand with the state’s signature spirit, it also draws attention from around the U.S. that Louisville is, indeed, a worthy beer destination as well as a bourbon and dining destination. Reconnect Louisville with its brewing heritage. Many in the city are unaware of the rich history of brewing in Louisville, and the rich heritage in beer culture in general. Louisville was once not just a thriving brewing hub, but also filled with lush, German beer gardens and beer celebrations that can and should be revived today to help promote local brewing culture. 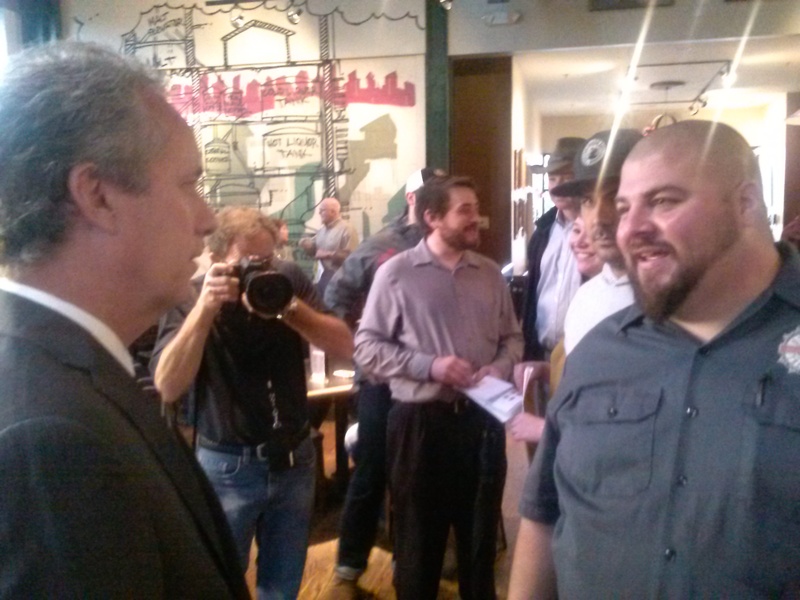 Louisville Mayor Greg Fischer chats with ATG’s Sam Cruz following Monday’s press conference. Sam Cruz, a co-owner of Against the Grain, spoke at the well-attended press conference as well, and presented Fischer with a growler of My Old Kentucky Common, which is based on a beer style created in Louisville in the 1800s. 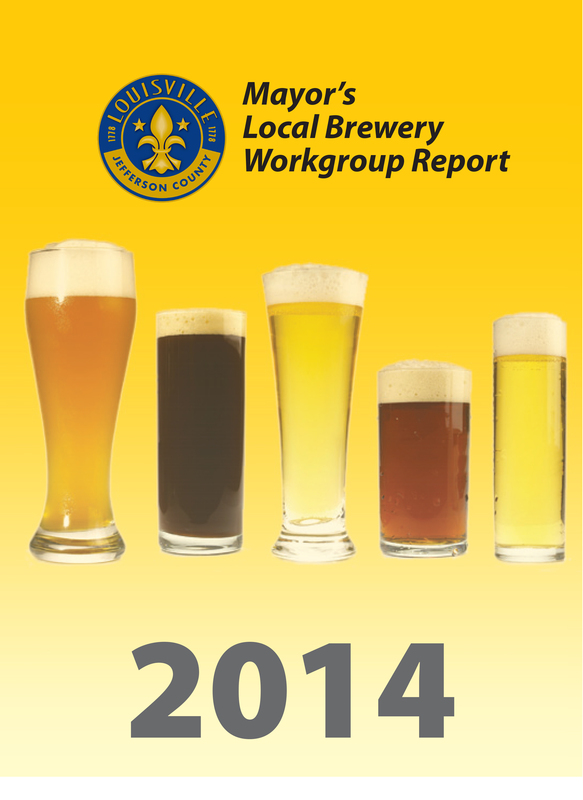 Fischer said the city will work with the Kentucky Guild of Brewers, the Louisville Convention and Visitors Bureau, and the breweries to implement and refine the report’s recommendations. He said the report already is having an impact in the form of ReSurfaced, which transformed a vacant area at 615 W. Main St. into a pop-up plaza for craft beer, music and art. Local breweries helped develop the project. The work group included representatives from area breweries including Against the Grain Brewery, Apocalypse Beer Works, Beer Engine, Bluegrass Brewing Company, Falls City Brewing, Gordon Biersch and New Albanian Brewing Company, the Kentucky Guild of Brewers, representatives from the city and Convention and Visitors Bureau and other consultants.